The longest day of the year began with partly sunny skies and still conditions setting a stage for our adventures that would utilize every bit of The Midnight Sun. Before breakfast National Geographic Sea Bird spent nearly an hour passively watching a lone sea otter that remained at the surface and gave our guests a most inviting show. This was a good omen for what was to follow the rest of the day. Today our exploration would be focused on a very productive and dynamic area of Southeast Alaska. A cluster of islands situated at the northwestern entrance of Icy Strait and lying east of Cross Sound, a body of water open to the Pacific Ocean and The Gulf of Alaska. This was first explored in 1794 by George Vancouver and his vessel The H.M.S. Discovery in their quest to find the elusive Northwest Passage. Though the passage was never charted on that historic expedition much of this wild and unexplored land and seascape was, including our first destination of the day, George Island. Geologically unique and located at the leading edge of the Pacific Ocean in this archipelago George Island also has an interesting historical past as well. Given its location this island served as a defensive military outpost with a six inch artillery piece installed on the rocky cliffs overlooking the opening to the protected waters of the Inside Passage for part of World War II. Aside from the unique geology and history of this island the natural beauty and productive waters around it make it a wonderful location to explore both on foot and by sea. While hikers trekked on the well maintained trail through the Sitka spruce forest to the gun emplacement others chose to paddle our kayaks along the rugged coast surrounded by rafts of kelp forests. Still yet, some of our shipmates set out in our Zodiac to circumnavigate this island and behold the wild scenery and abundant marine life. Among the highlights of these outings were dozens of Pigeon Guillemots rafting on the surface and clinging to the rocky walls, sea otters lounging on the surface, a lone harbor porpoise surfacing near the zodiac and lastly two humpback whales casually making their way across the sound. This encounter with these magnificent animals at close quarters in the open ocean will be a lasting memory for all that experienced it. Just a "stone's throw" away, in Alaskan terms, from George Island lies the quaint and unique hamlet of Elfin Cove. Tucked neatly away in what's lovingly referred to as "The Gunk Hole" by the locals this boardwalk community of less than 20 year round residence would serve as an interesting halftime to our day. After lunch we were invited to come ashore and stroll the 300 yards or so boardwalk acting as the community's causeway. With a past rich in both commercial and sport fishing Elfin Cove brings to life on way humans have adapted to live in this environment. Our third portion of The Lindblad Trifecta would prove to be the perfect way to wrap up our exploration of this incredible part of Southeast Alaska. The Inian Islands, and archipelago forming the vanguard to the northern entrance of The Inside Passage acts as a sieve and funnel to powerful tidal forces that twice daily influence this ecosystem. Long a favorite of our staff to share with our guest the islands would not disappoint. Not only had the skies cleared to a deep blue accented by high wisps of clouds but the marine life and birds came out on stage to thrill us all. Steller sea lions are well acquainted with the productive and predictable nature of the tidal surges that rip through the openings the islands afford. Hauling out on any available piece of real estate these social, charismatic, brutish and noisy animals were present in high numbers and with the aid once again of our fleet of Zodiacs we were able to get up close and personal to these nearly 2,000 pound animals. Several guests also got a great look at a handful of Tufted Puffins, an emblematic inhabitant of the waters and cliffs in this area. With a seemingly full day under our belts we returned to National Geographic Sea Bird for evening recap and dinner. While this author was "supervising" kids movie night in the lounge and writing this report a noticeable change in our course and speed was detected. Looking out the windows of the lounge the first of many humpback whale flukes was seen. Having navigated to the scenic waters around Point Adolphus our Chief Mate had spotted several blows of whales and positioned the ship for what would be an incredible evening of whale watching under the setting Summer Solstice sun. With well over a dozen whales surrounding us a particularly playful calf of the year and its' two Steller sea lion companions held everyone's attention for well over an hour. The calf when not by its mother's side was performing an incredibly diverse set of play behaviors from breaching to rolling over on its dorsal side exposing an all-white belly. All the while a pair of sea lions frolicked about in close proximity in what looked at times to be a well-choreographed ballet between these two very different marine mammals. The longest day of the year concluded with the sun setting behind the peaks of The Fairweather range and golden spouts from humpback whale blows on the horizon. InnerSea Discoveries' 76-guest expedition vessel Wilderness Explorer begins active adventure cruising among the Hawaiian Islands in fall 2013. 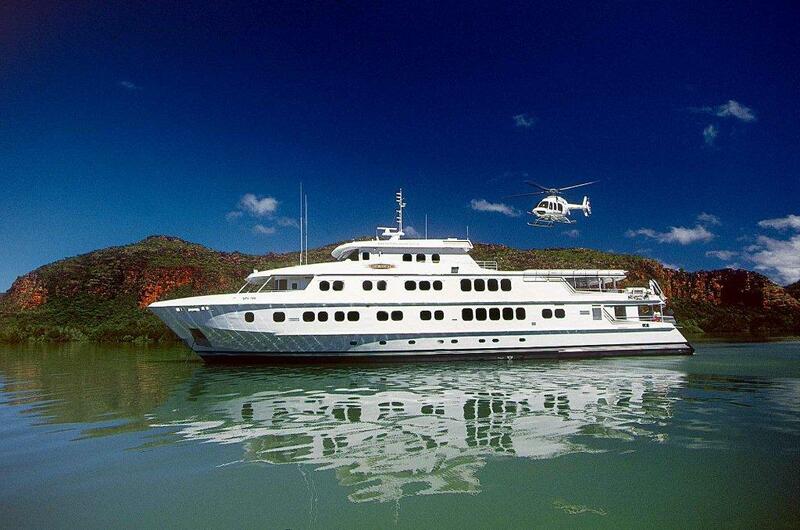 The boat joins the line's 36-guest upscale yacht Safari Explorer offering island explorations from the sea. From November 2013 through April 2014, the Wilderness Explorer will sail seven-night Adventure Bound Hawaii cruises between Oahu and the Big Island and reverse. The itinerary visits Ka'ena Point State Park, Wai'anae Harbor, Maui, Lana'i, Honomalino Bay, Opihihali and Kailua-Kona. Guests will also enjoy scenic cruising and searching for whales and dolphins in the wildlife-rich Humpback National Marine Sanctuary. "We are sending the Wilderness Explorer to Hawaii to add another option for travelers seeking an active island adventure at a moderate price." said Tim Jacox, executive vice president of sales and marketing. "It's a tremendous value when you add in all the included activities and the ability to explore multiple scenic islands." Highlights of the new itinerary include snorkeling at Molokini's undersea volcanic crater, a night snorkel with Giant Pacific Manta Rays, watching whales and dolphins and guided hikes exploring scenic areas on all four islands. Expert naturalists provide interpretation on guided excursions ashore and at sea. On board, innovative meals are served buffet style to accommodate a flexible schedule of adventure activities. A wellness program includes a sauna, fitness equipment, complimentary yoga on deck and massages for a fee. Cabins feature a flatscreen TV/DVD player, iPod dock and eco-friendly bath amenities. In the lounge, guests will find a selection of games and a library of books and DVDs. For luxury adventures in the Hawaiian Islands, the line's 36-guest Safari Explorer sails seven-night cruises between Hawaii, the Big Island and Lana'i with two days of activities on Moloka'i. Guests making a new reservation on the yacht by September 30, 2012 receive a $526 travel credit per couple for cruises November 2012-April 2013, contact The Small Ship Adventure Company for more information on 1 300 650 481. Cruise fares on the Wilderness Explorer start at $2,626 based on double occupancy. To book an un-cruise adventure or to request additional information, contact Small Ship Adventure Company on 1 300 650 481 or visit smallshipadventure.com. Well known for spectacular mountains, towering fjords and lush forests, New Zealand is also renowned as one of the world's top destinations for golfers. 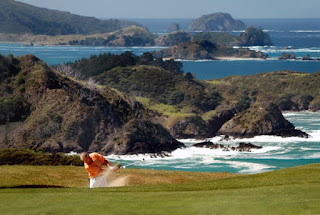 Orion's February 2013 South Pacific Golf Expedition will open the door to spectacular and challenging NZ golf courses. Included on the world's top 100 list these courses are on every golfer's wish list - made all the better experiencing them from the comfort of a small floating hotel, the highly awarded luxurious expedition cruise ship, Orion. Tee off on a select range of world-class courses including Royal Wellington, breathtaking Kauri Cliffs and the spectacular Cape Kidnappers, perched 500 feet above Hawke's Bay, a site that "belongs more to heaven than earth." With typical Orion forethought, this voyage includes green fees for 5 rounds of golf at Royal Wellington, Cape Kidnappers (2 rounds) and Kauri Cliffs (2 rounds), cart hire and golf club transportation to and from the ship for each golf course visited. Enjoy fine food and wine, attentive service, access to world class golf courses and the company of like minded enthusiasts keen to enjoy the day's challenges and relax at the 19th Hole in the evening. Friends or partners who are not yet keen golfers have not been forgotten as there is much to delight and excite them on this voyage. While you may be hitting an Albatross they may be observing nesting gannets at Cape Kidnappers, or sipping a crisp white at one of New Zealand's renowned wineries instead. Each day will reveal something special. From Wellington, where colourful Victorian houses grace the steep hills surrounding one of the prettiest harbours in the southern hemisphere, to the dramatic coastlines and extraordinary seascapes, this will be a round for all to remember. One 8 night voyage departs Lyttleton, New Zealand 16 February 2013. Voyage includes Wellington, Marlborough Sounds, Napier and Whangaroa, concluding in Auckland. Note Limited availability: Due to the popularity of this voyage only two categories of accommodation remain available, Category A and Junior Suites. Fares: A$7825 per person, twin share, for a Category A Ocean View stateroom; A$9,295 per person, twin share, for a Junior Suite. Mitkof Island is not only where the fishing town of Petersburg is found, but is also the location of a scenic trail between Ideal Cove and several lakes – Sand, Hill, and Crane, so named for the sandhill cranes that pass through here during migration. The calm, dry morning was ideal for a hike through lush temperate rainforest to the first of these meadow-trimmed lakes and beyond. Ferns, brambles and dwarf dogwoods known as bunchberry carpeted the ground along the plank walkway that paralleled a rambling creek, stained brown by tannins from the abundant vegetation. A marshy shoreline skirted the lake. It was dotted with bright-magenta blossoms of shooting stars, yellow Caltha-leafed avens, and white clusters of fringed bog-bean flowers. Pacific wrens, sapsuckers, Steller's jays, and hermit thrushes proclaimed their territories with raucous calls and bursts of song. One group opted for exploration by Zodiac instead of on foot. Eagles stared down from their perches at the passing boat. The tide was out, exposing sea stars and other intertidal creatures for close examination. Once everyone was back aboard, the ship headed for Petersburg, and our Photo Instructor offered a presentation on photo techniques and composition. The officers carefully maneuvered the National Geographic Sea Bird into the inner harbor just after lunch to allow an entire afternoon of activities. Flightseers climbed into float planes for tremendous views of the LeConte Glacier and the abundant icebergs and harbor seals within the fiord. Bicyclists took off to explore the surroundings at their own pace. A few chose to visit a trail to a muskeg, or peat bog, on nearby Kupreanof Island. In addition, people walked the docks to learn more about fishing boats and their gear or to practice recently gained tips on photography. One of the highlights here is beneath the floating docks, where an abundance of invertebrates make their homes. Giant plumose, painted, and powder-puff, anemones (pictured) cling to the surface along with mussels, sea cucumbers and feather-duster worms. In addition to the guided walks, there was time to wander the streets of Petersburg to take in the Norwegian heritage and local color of this working community. After recap we left the dock, and the galley presented a fine feast of fresh Dungeness crab. Once we had eaten our fill from the bountiful platters, we gathered in the lounge for an illustrated talk by Dr. Andy Szabo, Director of the Alaska Whale Foundation, about humpback research that he and his colleagues are conducting in Southeast Alaska. Eventually it was time for Andy to depart in his skiff, while we continued north for tomorrow's adventures. 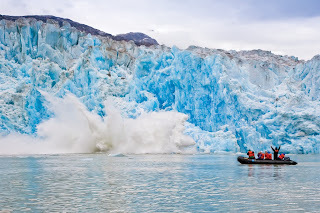 For many people, just the word Alaska conjures up adventures and glacier-filled wildness. Our day satisfied all those requirements. Early in the morning we passed into Holkum Bay, where floating bergie bits were being used for perches by eagles. Six stood upon one hunk of ice, and another allowed us a close approach to enjoy its magnificence. Later one flew along next to the ship and allowed many of us to photograph a flying eagle, as shown in today's expedition report. Our ship's officers anchored in William's Cove where we were briefed on life aboard the ship, how to maneuver a kayak, safely board a Zodiac, keep from being mauled by bears and get the most out of our camera gear. Later most of us hiked up to a muskeg or sphagnum bog to see what ten percent of the flatter, more poorly drained land of the Southeast looks like. No one lost a boot, but we enjoyed the sucking sounds of retrieving them. Devils club left only a couple of spines in tender hands for a memory of what you shouldn't touch in this verdant, wild landscape. Sailing into Tracy Arm is like entering a scenic cathedral. Towering walls festooned with forests and hanging gardens, waterfalls that trickle and fell from the heights, massive hanging valleys thousands of feet above you, grassy benches and snow-filled cracks with glaciers and horns in the distance all help qualify this as perhaps the most beautiful place in Southeast Alaska. The beauty of the rocks is stunning as well. With a name like the Coast Range Metamorphic and Granitic Complex, a hint is given as to how special it is. Granite is so resistant that most every scratch made long ago by the 5000-foot deep glacial ice is still here. Quartz intrusions had been injected, twisted, sheered, squiggled and stretched into a dizzying array of abstract lines that covered the walls. By the early afternoon we had made our way to a view of South Sawyer Glacier. We passed harbor seals on floating ice like the one in the photo. Once in Zodiacs we were able to make our way closer to the glacial front. We made a special effort to not disturb the harbor seal pups and their moms. They were halfway through their six-week suckling period before they will be weaned and abandoned to feed on their own. Trying to make a living with so little experience is difficult, and much of the fat reserve gained while suckling is used up. It's crucial that the pups remain undisturbed during this last bit of this easy life. South Sawyer Glacier showed a tremendous amount of deep glacial blue on much of its face and a magnificent calving was shared by all. The largest block that peeled away and tumbled into the sea was seen by many guests on the ship as well as those in Zodiacs. Recap and dinner were enjoyed as we passed out of the fiord and on to new adventures. Orion Expedition Cruises has slammed reports that it is planning to sell its 106-guest Orion, saying that the vessel is definitely not for sale. THE rumor mill went into overdrive last week after an international ship brokerage website posted a listing for Orion Expedition Cruises' (OEC) much loved small ship expedition vessel Orion, with a price tag of $50m. This week, OEC Founder Sarina Bratton told Cruise Weekly that the company is not selling Orion, and that the website in question had put the photo and details up in the hopes of being able take an offer to OEC and score a commission. Following a warning from the expedition specialist however, the website has since withdrawn the listing and apologised. "We have the most coveted and profitable expedition ship in the world," said Bratton. "There are lots of people who would love to have this ship, but we are not looking to sell," she added. In fact, Bratton said that rather than looking to sell Orion and change its format, the company is thriving and has more independent cruise bookings now than in any previous year. In addition, the company has also clocked a 33% booking increase for the next financial year, and is up a whopping 300% for the fiscal year 2014. "We are seeing significant business coming through," Bratton said, adding that domestic sales are currently at their highest levels post GFC. Sales are also growing healthily outside of Australia, with American and Japanese cruisers responding strongly to OEC's offerings. MEANWHILE, the company will hand back Orion II in 2013, meaning that next year it will not be running voyages in Japan, Russia and the Far East, and Vietnam. That does not however mean that OEC has given up on those itineraries, with Bratton saying that the feedback from passengers who have cruised those voyages has been fantastic, and that when the company acquires a second ship it will look to reinstate these offerings. 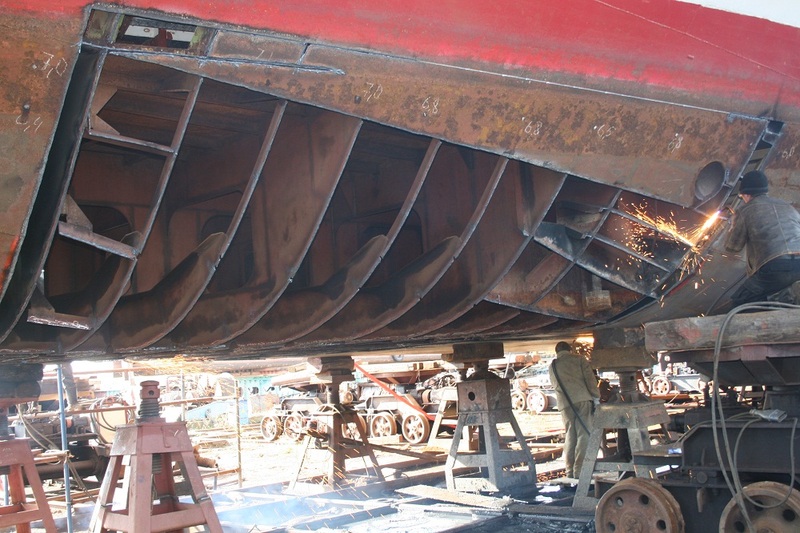 As for news on a second ship, Bratton confirmed that the company is still on the lookout for the perfect vessel to fit with the OEC brand, but has not yet found it. The company is also looking forward to releasing its new 2013 brochure in the next couple of weeks, as well as a brand new website and a new Orion App for iPhone and iPad users. The new website, according to Bratton, will be more interactive than the current site, and with more maps, satellite images, photos, and video footage, will give viewers a really great insight and appreciation for the expedition cruising experience offered by the company. "We offer a very different product to traditional cruising," Bratton said. "We travel to very remote places, and offer in-depth destination experiences, and the new website will help people to understand the value of what Orion stands for," she said. Early morning found us cruising into the beautiful Red Bluff Bay, a striking inlet that cuts into the corner of Baranof Island. We were rewarded with the sighting of a brown bear and two cubs at the base of the cove, foraging on grasses and mussels early in the day. Mid-morning, naturalist Pete Peterson gave an informative lecture on "terrain tracks," highlighting the kinds of rocks and geology of Southeast Alaska. He explained that bits and large pieces of the earth's crust moving from the areas of the South Pacific, transported and grafted on piecemeal, make up Alaska. These blocks have been as large as several thousand square miles, traveling thousands of miles across the Pacific basin and added in waves, the last one beginning about 200 million years ago and continuing through to the present. In the true spirit of adventure, our expedition leader, Larry Prussin, and Captain Coughlin offered us an unexpected treat to explore a place called Takatz Inlet. In no time after the anchor was set, our efficient crew lowered Zodiacs and kayaks for us to explore this captivating place. Steep walls, cascading waterfalls, verdant forests right to the edges of the cliffs surrounded us in the roomy fjord, and with low tide, provided interesting outcroppings and nooks to explore. Crystal-clear waters offered up great views of lion's mane jelly fish and rocky ledges for small fish to zip in and under amidst numerous crustaceans. Harbor seals showed their cute faces intermittently, providing a photo-op for the ready camera. The surrounding beauty, with sun peeking out, giving reflections of the walls on the water in this calm peaceful place, will no doubt be one of the highlights we can store in our minds' memory banks! Lunch brought us inside and afterwards, just when we thought we might grab a siesta before landing at Lake Eva, a humpback whale lured us to the bow. Our first good sighting was well appreciated, as we observed the behavior of lunge-feeding and diving. 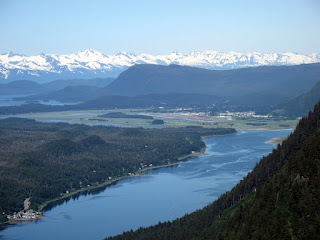 Continuing our journey up Chatham Strait and into an arm called Peril Strait, we anchored at Hanus Bay, a small cove jutting into the northeastern coast of Baranof Island. Various hikes were offered into this rich mossy forest; some leg stretchers with a fast walk to Lake Eva and the reward of numerous old growth Sitka pines, or simply meandering into the soaring canopy along the river, neither options disappointing. Truly a full day of grandeur in Southeast, and the magnificent beauty that we were fortunate to "step" into. This is the reason I've come back here many times, and I know this to be true for others who shared this day—the eve of summer solstice! It's one of those vexing trivia questions. What is the capital of the US state of Alaska? No, not Anchorage as most people would suggest, but the tiny port city of Juneau, home to just few more than 30,000 hardy folks. 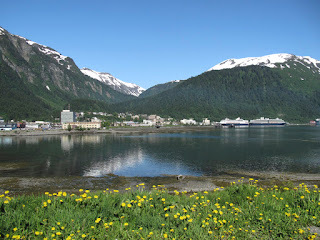 Like so many cities and towns on the frontier, Juneau was founded in the late 19th century gold rush and quickly developed into a busy transport hub. Curiously though, Juneau has never been accessible by road. The completely land-locked city can only be reached by air or water. As a cruise port, Juneau sees around 560 dockings each season ranging in size from the tiny 60-passenger National Geographic Sea Lion to the massive Rhapsody of the Seas. The city benefits enormously from the almost 900,000 cruise passengers who pass through the town dropping dollars in the stores, restaurants and attractions. On one day alone, I saw four large and three small vessels load and leave the wharf for the waters of the Inside Passage. Glacier Gardens Rainforest Park. A painstakingly constructed 50 acre botanic display built on top of land devastated by a mudslide in 1984. Get up close to the unique plant species that inhabit the Tongass National Forest – the largest temperate rainforest in the world – where some of the trees are 700 years old. Hear the fascinating story of the gardens' genesis, learn about native herbal medicines and ride the buggy to the panoramic viewing platform for a spectacular overlook of Juneau. The other great view is from the top of the Mount Roberts Tramway which leads up from the wharf. Just what is an 'upside down flower tower'? Mendenhall Glacier. Okay, you will see plenty of glaciers from your ship, but the easy, drive-to visitor centre adds education and interpretation that may be missing from your big ship experience. Wildlife encounters are common here too. Yes, even bears. Alaska State Museum, right in town, contains an impressive collection of native artefacts and also covers recent human history as well as a natural and geological overview. Macauley Salmon Hatchery. Now this might sound a bit dull, but I thought it was fascinating. See and learn how wild salmon are used to enhance fish stocks in the waters throughout Alaska's Inside Passage while you tour through the extensive facility. 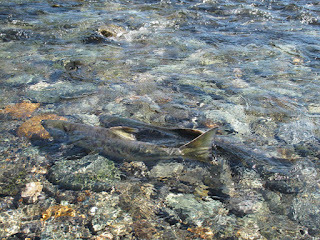 This hatchery, one of 36 in Alaska, releases 115 million fish each season. Plus I learned two new words today: osmocompetent and otolith marking. See! Needless to say, the fishing is amazing with massive Halibut, nice fat salmon as well as other varieties like freshwater Dolly Varden and cod. 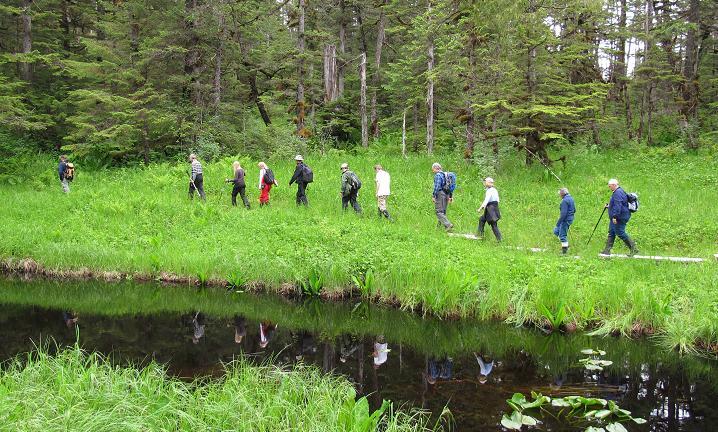 Alaskans love to hike and there are more hiking trails in Juneau than roads and you can stroll off for up to four hours on any of the trails out of town. Just be sure to complete Bear Safety 101 beforehand. Variety Cruises' new build 223-foot, state-of-the-art Mega Yacht, Variety Voyager, debuted in May and is the first sea-going vessel to become a member of the exclusive Preferred Hotels & Resorts' Preferred Boutique Collection. This luxury vessel was constructed in Perama Shipyards, Greece at a cost of 29 Million Euro. The Variety Voyager is one of the top five Mega Yachts available worldwide offering 36 cabins for just 72 passengers, sleek modern design, ample deck space, unobstructed views of the ocean and ports, along with an attentive 28-member service crew. "We are proud to present this exquisite ship as part of Variety Cruises' 11-vessel fleet," says Yiannis Vontas, Variety Cruises Senior Partner and Executive Vice President of Development & Marketing. "Launching this brand new ship is a testament to the continued growth of our company and of the increased demand for small ship cruising." The Variety Voyager is presently operating exclusive charters and scheduled cruises in the Adriatic, from Venice, Trieste, Dubrovnik and Split. It is now deployed in the West Mediterranean for a four-month cruise season with sailings from Nice, France and Salerno, Italy on the new Romantic Rivieras itinerary starting July 14. · Indoor restaurant seating 74 guests with expansive floor to ceiling glass windows to showcase ocean views and which open to provide al fresco dining. 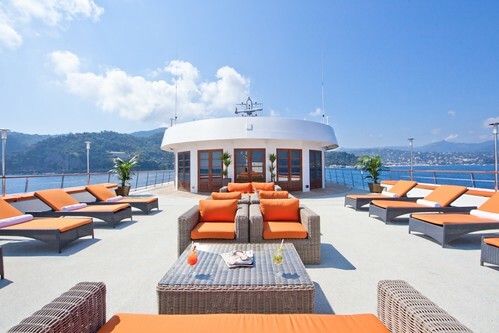 · Lounge area in the main deck seating 74 passengers with adjoining reception area and bar. · A trendy and spacious outdoor Deck Bar Lounge featuring late-night entertainment from resident Pianist and DJs. Please visit, www.varietycruises.com for more information or call 1-800-319-7776 (US) and 1-866-944-8498 (Canada) to receive the 2012/13 Variety Cruises brochure. Scenic Tours today announced the successful registration of their small ship Scenic Tsar in Russia as the first 'new build' ship to be registered in Russia for 25 years. The Russian Maritime Authority classifies 'new build' as one that is at least 80 per cent new and Scenic Tsar (originally named ms Grin] has undergone a total reconstruction, the most extensive re-build ever undertaken in Russia, funded by Scenic Tours. 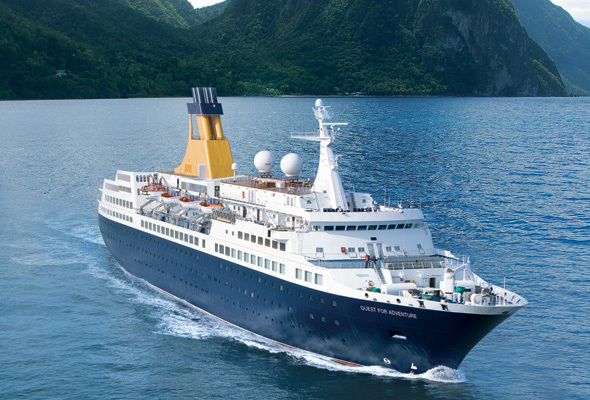 Scenic Tours Managing Director, Glen Moroney said that in order to operate a ship that met "both our world-class standards and the complex Russian regulations, we chose to embark on a total gut and re-build of an existing ship. Scenic Tsar is a new style of ship and will take the experience of river cruising in Russia to a whole new level." He said that due to the complete rebuild "from hull upwards," the Russian authorities ultimately decided to put Scenic Tsar through its stringent 'new build' ship registration process. Moroney added that Scenic Tours' objective is to "deliver the same high level of quality and service over all of our products", with professionally trained and experienced staff providing a standard of excellence. With only its original steel hull, floors and ceiling remaining, Scenic Tsar now boasts a new deck of cabins, two new bars, a new lounge, a new restaurant, a new wellness area, a new galley with all new equipment, all new cabins (walls, showers, toilets, and all fittings), new air conditioning (main compressor, ducting and in cabin fan coils), new main engines and drive units, new generators, all wiring and electrical fittings, new plates on the steel hull, and all new furniture, curtains and soft furnishings. Widely renowned for their world-class Scenic 'Space-Ships' which revolutionised river cruising in Europe, Scenic Tours are again setting the benchmark with Scenic Tsar, their first boutique small ship in Russia. Scenic Tsar will cater for a maximum of 112 guests who will experience the Scenic Tours signature of all-inclusive cruising . 93% of cabins have private, full-size balconies, stylish en suites, satellite TV, in-room safe and mini bar, and bottled water replenished daily. In addition to the luxurious new features and amenities, Scenic Tsar also includes complimentary Wi-Fi and an on board doctor. All meals are included and guests will enjoy both continental and Russian cuisine, whilst complimentary wine, beer and soft drinks are included with dinner. Scenic Tours will be running the exclusive charter of the Scenic Tsar for the next five years with the inaugural taking place last Sunday, June 17 2012 from St. Petersburg to Moscow on the Scenic Tours 15 day Imperial Jewels of Russia River Cruise, including four days each in St. Petersburg and Moscow and visiting Mandrogi, Kizhi Island, Goritsy and two of the 'Golden Ring' cities. Guests will discover Russia's most iconic sites, and experience exclusive Scenic Enrich events, from lunch at an old-world wooden restaurant to a private ballet concert at the Palace of Prince Vladimir. 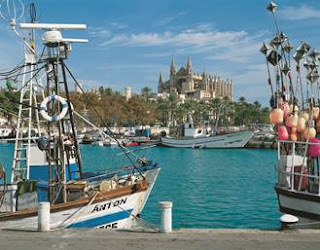 A full list of dates and itineraries are at scenictours.com.au. Departing 07 November from Valencia, Spain the 12 night voyage will include visits to the picturesque villages of Andalusia and their whitewashed houses and Seville the capital of fiesta and flamenco. Sea Cloud II will then call into Lisbon, Portugal before sailing on to experience the countryside of Madeira, often described as the island of Eternal Spring. The UNESCO sites of Garajonay National Park and La Laguna are also a highlight before she arrives into Las Palmas, Gran Canaria on 19 November. Fully inclusive rates commence at AUD$3760 per person for the 12 night voyage if booked before 30 June 2012, normally AUD$6260 per person so a saving of AUD$2500 per person. For those with less time there is also an 8 day option departing Valenica 07 November and arriving 15 November in Funchal, Madeira with rates commencing from AUD$2605 per person, a saving of AUD$1695 per person. Until that time, Galapagos Explorer II will continue on its planned schedule of cruises and will continue to be operated by Canodros, which is based in Guayaquil, Ecuador. Canodros will also continue handling reservations for Galapagos Explorer II, as well as sales and marketing through its established network of travel companies and tour operators. The acquisition will enable the award-winning cruise company chaired by Manfredi Lefebvre to expand the Silversea Expeditions brand. Its existing expedition ship, Silver Explorer, is regularly deployed in the polar regions, and the addition of a second vessel, offering year-round unique luxury expedition cruises in the Galapagos archipelago, means Silversea will have the opportunity to offer the adventure traveller a broader portfolio of itineraries, encompassing some of the world's most desired and least explored regions. The 4077-ton Galapagos Explorer II offers the stylish elegance of a mega-yacht, attentive on board service and an enriching naturalist education program. All of its 50 spacious suites feature ocean views and 24 include private balconies. Public spaces include a restaurant, piano bar, library and Internet station, main lounge, outdoor bar, two outdoor whirlpools, and a marine observation deck. Guests sailing aboard Galapagos Explorer II will continue to enjoy the same exciting itineraries, luxury accommodations, shipboard amenities, informative lectures and sustainable tourism for which Canodros is known. Potential guests and travel agents interested in booking a Galapagos Explorer II voyage should visit www.galapagosexplorer.com for more information. Guests currently booked on Galapagos Explorer II, and travel agents or tour operators with clients booked on the ship, should continue to liaise through their normal channels with Canodros for any needed assistance with their reservation. In the coming months, Silversea will announce more details concerning plans for the ship after it is renovated and renamed. Continuing their reputation as Australia's pioneers of adventure cruising, North Star Cruises have again set the benchmark with the release of new itineraries in Papua New Guinea. During 2011, the company's revered adventure-cruise ship TRUE NORTH undertook a 21 day circumnavigation of the Bismarck Sea. Senior captain Brad Benbow and ships biologist, Dr Andy Lewis collaborated with a boatload of enthusiastic passengers to refine the company's new Sepik Safari and Bismark Bonanza itineraries - ensuring brand new opportunities to discover virtually unseen and untouched areas of Papua New Guinea. TRUE NORTH was purpose built to access shallow coastal environs and river systems allowing all on-board to go where others cannot. The ship also uniquely features an on-board helicopter and six dedicated expedition boats providing guests with much greater opportunity to do what they want when they want. And 20 crew-members look after just 36 guests ensuring the company's reputation for personal service. Highlights of the refined 2012 itineraries include vast reef complexes around Rambutyo Island, the turquoise waters of Ninigo Atoll, heli-flights over active volcanoes, swimming with manta rays, black-bass fishing and cruising on the mighty Sepik River. Guests will be intrigued by visits to the spirit house at Yentchan Village and may even witness rarely seen rituals. There are also opportunities to purchase exotic artefacts. Life on-board the TRUE NORTH offers something for everyone, from a lazy basking in the sun to diving, hiking and fishing in what can only be described as a fisherman's paradise. Divers and snorkelers can expect some of the best underwater scenery on the planet, with the myriad reefs in the Hermit and Ninigo atoll complexes providing countless coral playgrounds, no words can describe the underwater beauty. And fish guru Dr. Gerry Allen will also be part of the 2012 line up. "The 2011 voyages completely surpassed all our expectations, when world experts see things that cause them to gasp in awe we know we are seeing something very special and sharing all this with our guests is always our joy", said North Star Cruises director Craig Howson, a veteran of 25 years adventure-cruising on the Kimberley coast. Another major drawcard for guests has been meeting the Melanesian people of PNG. The new cruises continue to provide guests with wonderful opportunities to interact with local people throughout the very remote areas that are visited. Highlights include witnessing tribal gatherings along with log drumming so powerful that it shakes the earth and, being welcomed to watch festooned warriors and brightly dressed maidens perform the traditional sing-sings. On the Sepik River visual feasts abound as the young Australian crew chaperones in the expedition boats through narrow waterways that suddenly open into vast inland lakes whilst while a further journey down-river reveals a village on stilts. Warm greetings from locals bearing flowers and gifts will overwhelm everybody on-board. Guest can expect first class service and revered cuisine including the daily catch of mackerel, wahoo and yellow fin tuna. Guests can completely relax, knowing that after each day of adventure they will return to their luxurious cabins to prepare for pre-dinner drinks and fine dining. 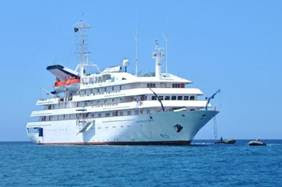 Cruises to PNG start from 27th October 2012. APT’s new association with Noble Caledonia arrives just as the expedition ship MS Caledonian Sky joins sister ship MS Island Sky in the Noble Caledonia fleet. Formerly known as Hebridean Spirit, this vessel began her new life with Noble Caledonia following an extensive refurbishment which features wood panelling and brass fittings. Built in the same ship yard as the MS Island Sky, the MS Caledonian Sky shares the same attributes as her sister vessel, joining her as one of the finest small ships in the world. “Both reflect the onboard service standards, comfort and luxury style of APT river ships in Europe, so our passengers will be at home with the Noble Caledonia brand,” she said. “These luxury expedition ships are the size that allow us to access areas not available to large sea cruise ships, so with inflatable Zodiac landing craft we provide easy discovery shore excursions which is what we deliver on our river ships,” Ms Fox said. MS Island Sky underwent a significant refurbishment in May 2010 to make her one of the finest small ships in the world. With a maximum passenger capacity of 116, a vessel of her size is capable of carrying many more but instead the MS Island Sky has the benefit of unusually large suites, luxuriously appointed public areas and spacious outside decks. MS Caledonian Sky will first sail around Britain, then north to the Arctic before heading for South America, Australasia and the Pacific Rim. APT will have a number of exclusive sailings, including its 85th anniversary celebration cruise in 2013, hosted by Geoff McGeary, cruising through the seven seas of the East Indies from The Philippines to Darwin. This cruise explores relatively unknown regions of The Philippines, Indonesia and the vast island of Borneo. 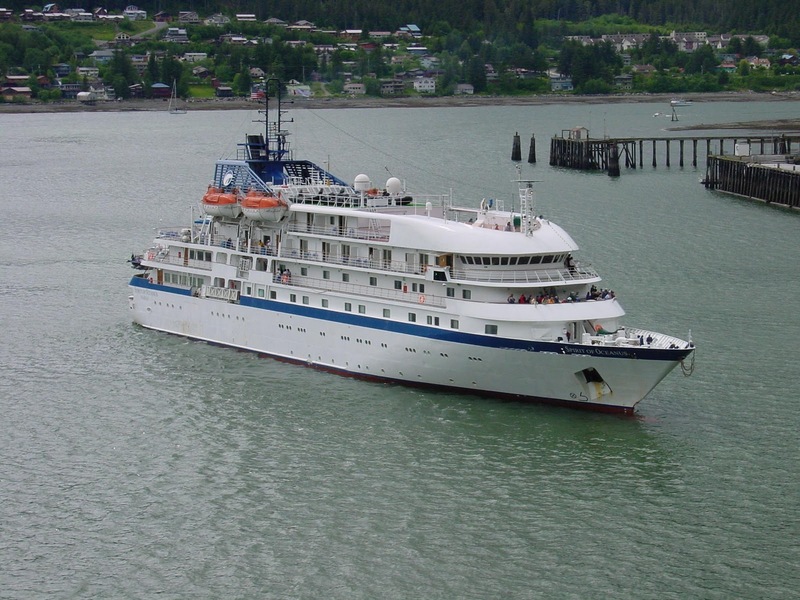 MS Caledonian Sky is also featured in APT’s European program with a Botanical cruise, and in Alaska. 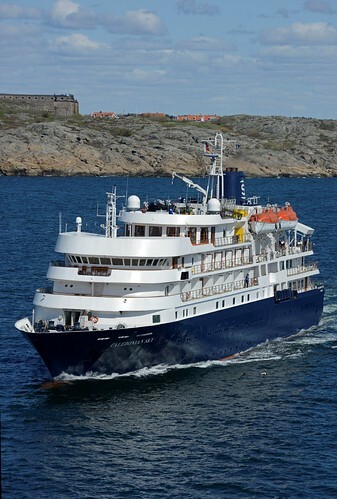 The MS Caledonian Sky accommodates a maximum of 114 passengers in 57 spacious outside suites. Many have walk-in wardrobes and some feature tub baths. There will be seven categories of suites and 23 have private balconies. For those familiar with the MS Island Sky, she will feel like a second home, although there are some differences. The dining room, lounge, Lido Deck and bar are all similar. However, the ‘Club’ on the MS Caledonian Sky has been transported to the very top deck. Here, there is a library and bar which leads out on to a lovely forward deck. The ‘Club’ has wonderful views with ceiling to floor windows. A crew of 74 (similar to MS Island Sky) not only offers an excellent service they are also noted for their kindness and attention to detail. With only one sitting and a maximum of just over 100 passengers, the quality of cuisine is of a consistent superior quality. Where possible and when it meets his high standards, the chef will obtain local produce in markets or buy the catch of the day from a passing fishing boat. Such purchases enhance the well stocked larders and bring a local touch to the varied menus. In the main elegant dining room, breakfast is served buffet-style, with certain items cooked to order and lunch and dinner is à la carte. When weather permits, breakfast, a buffet-style lunch and dinner are also served on deck. A selection of wines is included with lunch and dinner. Afternoon tea is served in the lounge and tea and coffee are available 24 hours. With sufficient notice, most diets can be catered for on board. The passenger accommodation is arranged over four decks and all suites have outside views. All feature a sitting room area and some have private balconies. 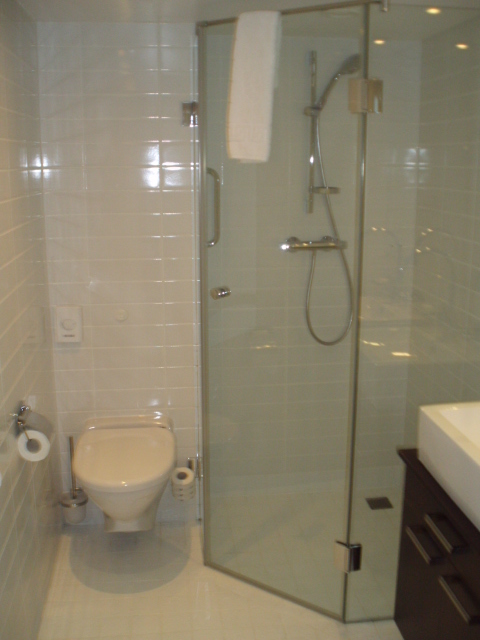 Each affords considerable comfort with en-suite bathroom featuring a country style wash basin, hot towel rack and vanity unit with sink and walk-in shower and/or bath tub. Facilities in the suites also include walk-in or spacious wardrobes, dressing table with large mirror and stool or desk, mini-fridge, flat screen television, telephone, programmable electronic safe, hairdryer, assorted toiletries, air-conditioning and heating. Bottled water, towelling dressing gowns and slippers are also provided. The spacious and finely decorated public rooms include a large lounge where daily briefings and talks will be provided throughout the voyage and an elegant bar where a pianist plays periodically throughout the day. The bar also features a 24-hour tea and coffee station. In addition there is the Club Lounge on the Panoramic Deck which features a bar. The onboard travel library is the perfect place to relax with a book and is stocked with reference books pertaining to the places the vessel is visiting along with a selection of games and two computers with internet access. Daily newspapers and magazines are also placed in the library depending on local availability. Outside there is a rear Lido deck where meals are served in warm weather under shade. On the top deck there is a further observation and sun deck with bar service and comfortable deck furniture for sun bathing or relaxing with a book. There is also a small gymnasium onboard and hairdressers with appointments made on request. Australian privately-owned travel company APT has strengthened its presence as a global destination travel company with the APT Group taking a strategic interest in the UK-based Noble Caledonia which operates luxury small ship cruising and land touring worldwide. APT owner, Geoff McGeary announced the purchase today at a Sydney travel industry lunch marking the 85th anniversary of the family-owned business which is based in Cheltenham, a southeast suburb of Melbourne. APT began in the early 1920s when Bill McGeary built a bus body onto a tray truck after a cable tram strike crippled the city of Melbourne. Today, the business continues to be managed by son Geoff, with the involvement of third generation Rob and Louise. Noble Caledonia, formed in 1991, operates river cruises, expedition cruises, small ship cruises and land tours in 15 world regions, including Antarctica and the Arctic. With seven vessels hosting between 50 to 160 passengers. Noble Caledonia owns two vessels and operates the others on long-term charters. It markets its holidays across the northern hemisphere. Mr McGeary said it would be “business as usual” for Noble Caledonia with APT’s significant shareholding. The purchase price is undisclosed. Mr McGeary said Noble Caledonia “fitted perfectly” with APT’s business platform – providing high quality, high comfort, small group, fully inclusive pricing and professionally escorted travel experiences, primarily for the discerning 50-plus market. APT has already incorporated Noble Caledonia vessels in its 2013 Botanica garden tours, European river cruise program and its most recent Canada-Alaska brochure. The two-way benefits of the partnership are the strengthening of Noble Caledonia’s Australian distribution and Noble Caledonia assisting APT’s UK distribution, Mr McGeary said. “Noble Caledonia operates independently under the long term direction of London based Managing Director Andy Cochrane and we are pleased to be in partnership with the Swedish Salen family who have a long history in ship ownership and operation,” Mr McGeary said. APT operates luxury-style escorted tours and cruising in Europe, Russia, Canada-Alaska, Vietnam-Cambodia, China, Africa, South America, Egypt-Jordan, New Zealand and Australia (Tasmania, Norfolk Island, Kimberley, Outback, Queensland and Northern Territory). It markets in Australasia, the UK and Europe and North America. Mr McGeary said APT’s growth had been generated mainly by its presence in Europe river cruising, its entry to Vietnam and Cambodia, Africa, lodges in the Kimberley, continued strength in Canada & Alaska and a return to South America. The Noble Caledonia shareholding follows a majority stake taken mid 2009 in UK-based Golden Eagle Luxury Trains Limited (formerly known as GW Travel), a leading operator of long distance luxury tours by private train. Its flagship train, the Golden Eagle Trans-Siberian Express, is Russia’s only private luxury train which has become synonymous with the world’s most iconic rail journey. APT is also a co-owner with the experienced European river cruise company, AmaWaterways, a seven-year partnership that has seen APT emerge as the largest supplier of European river cruises in the Australian-New Zealand market, operating 10 of its own river ships (12 next year). Mr McGeary only recently returned from hosting the first APT Club adventure in Africa and from inspecting the refurbished MS AmaKatarina river ship in Russia. Australia and the South Pacific's pioneer of small-ship expedition cruising Coral Princess Cruises has launched a new 25-night Spice Islands, Raja Ampat and New Guinea circle expedition as part of its 2013 schedule. 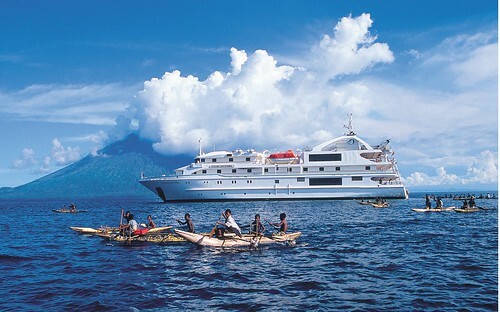 The itinerary, operated aboard the state-of-the-art flagship Oceanic Discoverer, is featured in the company's newly released 2012-13 Papua New Guinea and Melanesia brochure. The inaugural expedition, which departs Darwin on 26 September 2013, explores the remote Tanimbar and Spice Islands of Indonesia before a 5-day exploration of the scenic 'Four Kings' of Raja Ampat. The itinerary continues into the Northern Hemisphere and Mapia Atoll before returning to the West Papuan provincial capital of Jayapura, and onwards to Wewak. Exclusive to Coral Princess Cruises, guests will spend two nights cruising 100 kilometres up the mighty Sepik River, before exploring the east coast of PNG including Lababia, Tufi and the Trobriand Islands. The expedition will conclude in Cairns on 21 October 2013. Tony Briggs, Founder and Managing Director of Coral Princess Cruises, says that the new program is the most comprehensive expedition ever undertaken in the region, and is the result of feedback from some of the company's most frequent travellers. "Our guests are always looking for new opportunities to discover the South Pacific's most exotic and remote destinations" he explained. "I'm excited that this expedition enables guests to experience one of the world's emerging regions, in the comfort and unrivalled style they have come to expect from a Coral Princess Cruises expedition." Briggs, who has recently returned from a fact finding visit to the area, described the itinerary as the company's "most ambitious yet." Prices for the 25-night Spice Islands, Raja Ampat and New Guinea circle expedition aboard Oceanic Discoverer start at $18,990 per person in a Main Deck (Category B) Stateroom. A limited number of staterooms are also available on a shorter 13-night leg from Darwin to Wewak and a 12-night itinerary from Wewak to Cairns. The new brochure also includes a series of 10 & 12 night Papua New Guinea expeditions from Cairns and Rabaul, along with two 13-night itineraries through the Melanesian archipelagos of New Caledonia, Vanuatu, the Solomon Islands and PNG. To celebrate the launch of the brochure, Coral Princess Cruises is offering discounts of up to 25% for past guests, or 15% for first time travellers on their 13-night Melanesian expedition from Rabaul to Noumea, departing on 11 November 2012. Prices start at $8,242.50 per person in a Main Deck (Category B) Stateroom for past guests. For a limited time, single travellers are also being offered the opportunity to join the same expedition without the need to pay a single supplement. Australian-owned Coral Princess Cruises pioneered small-ship expedition cruising in Australia in 1983 and operates a fleet of three small ships on Australia's Great Barrier Reef, Kimberley Coast and Cape York & Arnhem Land. Further afield, there are expeditions to Papua New Guinea, Melanesia and New Zealand. Tourists have been caught sowing barley in Antarctica, in a biosecurity breach that has drawn attention to calls for tighter controls on polar tourism. Two members of a gospel group travelling with a Canadian tour company were seen dispersing barley seeds as they hiked on Deception Island in the Antarctic Peninsula, where rising temperatures are leading to increased plant growth on previously barren ground. The incident was reported by the International Association of Antarctic Tour Operators to the annual Antarctic Treaty meeting in Hobart yesterday. Just 'LIKE' Adventure and Expedition Cruising and we'll send you the details. Simple. Captain Cook Cruises Fiji has continued its promise to refurbish its cruise ship the MV Reef Endeavour with the completion of a soft refurbishment on all outdoor and indoor furnishings. The MV Reef Endeavour now has brand new modern outdoor furniture around the pool and new sun lounges on B deck and on the sun deck. There is now comfortable el fresco dining furniture around the pool and on the sundeck, in addition to the elegant air-conditioned dining room. New carpet has been laid in the ship's lounge and dining saloon with new furniture completing the make-over. All Staterooms have been fitted with new bedspreads. The ship now looks even more elegant and modern and the soft refurbishment comes after the MV Reef Endeavour had an extensive rebuild and renovation last year with the building of brand new suites, interconnecting family rooms and a refurbished spa and gymnasium. 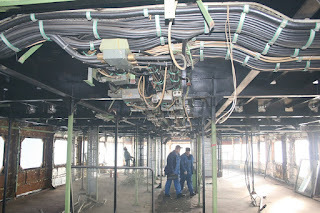 "These rebuilds and refurbishments complete a whole new experience for our many repeat passengers and give something exciting and unique for passengers embarking on their first cruise. Now passengers will continue to be welcomed by the friendliest people in the world in an even more comfortable and relaxed environment." said Jackie Charlton, CEO, Captain Cook Cruises Fiji. Families now have the choice between the new and spacious interconnecting family rooms which sleep two adults and two children or the inside family cabins which sleep four people in bunk style accommodation. The Reef Endeavours Senikai Spa and gymnasium also had a complete refurbishment. Additional Tabua suites and interconnecting family rooms are planned to be built in 2012. Cruising the lesser known islands of Hawaii with American Safari Cruises. 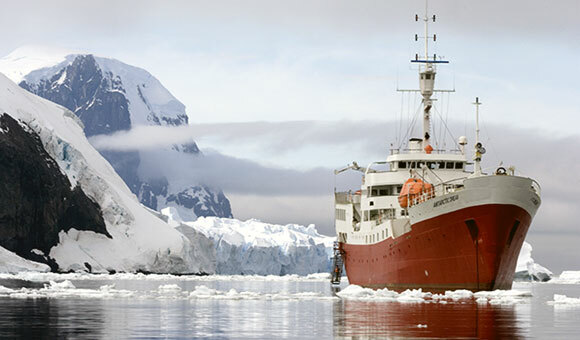 Recently we have been informed by the owners of the Antarctic Dream (Chile), that they will not deliver the ship to Oceanwide Expeditions in time for the Arctic 2012 Season. 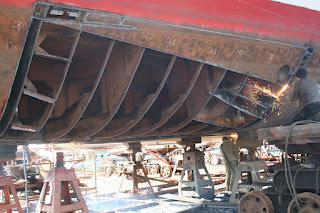 This is due to delays in the repair of essential parts of the ship. The ship does not meet yet the requirements of the Flag State for passenger vessel certification. As a replacement we have managed to charter the "Sea Spirit" from ISP for the period July 10 - Sep 08, 2012, LYR - Spitsbergen - Greenland - LYR, which will enable us to sail on the planned dates offering the same programs with your passengers for the following six Antarctic Dream voyages. Your passengers will be accommodated in cabins on the "Sea Spirit" with the same or better standard than the cabins for which they paid for on Antarctic Dream. We apologize sincerely for this, and regret the disappointment this will cause you and your passengers booked on any of these three departures. With your cooperation we will try as much as possible to mitigate the negative effects of the cancellation. Full paying passengers, including tour leaders (other than reduced or FOC escorts, FOC passengers or FOC journalists) booked on ATD06 and ATD07 are invited to rebook on our OTL, PLA and (the replaced ATD) now SPI voyages subject to availability and on a first come first served basis. Passengers booked on ATD14 are invited to rebook on (ATD13) now SPI13, Aug 27 - Sep 08, Greenland. Your clients who do choose to rebook their voyage on any of the above mentioned voyages, may encounter flight ticket change fees. The change fee amount will be reimbursed by Oceanwide Expeditions. Your clients who do not rebook this season, can rebook for Arctic 2013 for the same prices as they paid for Arctic 2012. In effect, this gives a discount of 5 % on the Arctic 2013 rates. Alternatively they can book on a selection of our Antarctic 2012 - 13 Peninsula voyages (10 or 11 nights) with a discount of 30 %. The amount paid for your cancelled arctic trip will be applied as deposit paymentfor the Antarctic trip (at the 30% discounted level) and any balance owing will be due at normal time of final payment deadline. In both situations, should your client incur flight change fees, these will be reimbursed by Oceanwide Expeditions. For your clients who choose not to rebook their voyage, we will refund the net (cruise) fare paid to Oceanwide Expeditions. Change fees for flight tickets, including cancellation fees will be reimbursed by Oceanwide Expeditions to a maximum of 600 USD. For your clients who do not rebook their voyage, we will give you a bookings fee of 450 USD as compensation for not earned commission. We sincerely hope that we can find a satisfactory solution for your clients on the three cancelled ATD voyages. At the same time, we sincerely apologise for any inconvenience caused. All current no-name allotments without commitments on the OTL and PLA voyages will be cancelled herewith. With your consent we are ready to rebook the passengers from ATD08 through ATD13 on SPI08 through SPI13 for the same programmes and same or better cabins. We are also ready to rebook the passengers from ATD06, ATD07, and ATD14 on alternative departures. OVER-50s seeking a combination of soft adventure, broadening of the mind and also the enjoyment of the good life, can join an amazing 42 night sailing exclusively for their age group from Cape Town on March 1 next year visiting some 25 ports along the African West Coast, the Canary Islands, Portugal, Gibraltar, Spain, Algeria, Italy, Malta, Greece and finally Piraeus for Athens. And even though this unique 6 week cruise aboard Saga Cruises' just 450 guest Quest for Adventure also includes 2 nights pre cruise stay at the Cape Royale Luxury Hotel and Spa in Cape Town with breakfast daily, 2 nights post cruise at the Hilton Athens hotel with breakfast daily, return Economy Class international airfare and all applicable taxes, it is priced through Cruiseco from $9,580pp twin share ex Sydney, Melbourne, Brisbane and Adelaide, and from $9,380pp twin share from Perth. As well, Saga Cruises' yacht-like Quest for Adventure also includes a choice of energetic tailor-made shore excursions in twelve of its unusual and exotic ports of call, combined with informative on board lectures to provide the very best in-depth experiences ashore. Quest for Adventure has two restaurants, five bars and lounges, a cabaret lounge, casino, library, pool, Spa and on-deck movies at night. For a fully-detailed itinerary and the name of your nearest Cruiseco cruise-specialist travel agent go to www.cruising.com.au. ADDITIONAL DETAILS: Highlights of shore-side experiences will include venturing into the world's oldest desert in Namibia, visiting a restored palace in Benin, watching an ancient voodoo ceremony in Togo, a walk through the canopy of a Ghanaian rainforest and watching salt-harvesting on Senegal's Pink Lake. Guests will also learn about Freetown's past as a settlement for freed slaves, make a stop in Gambia that's one of Africa's smallest countries, see the diverse landscape of the Canary Islands, delve into Spain's Roman and Phoenician history in Cartagena, explore contrasting Arabic heritage and Roman ruins in Algeria, in Sicily visit Medieval Trapani and the UNESCO World Heritage site Syracuse, and marvel at Monemvasia – the tiny fortress island with its interesting Byzantine history. 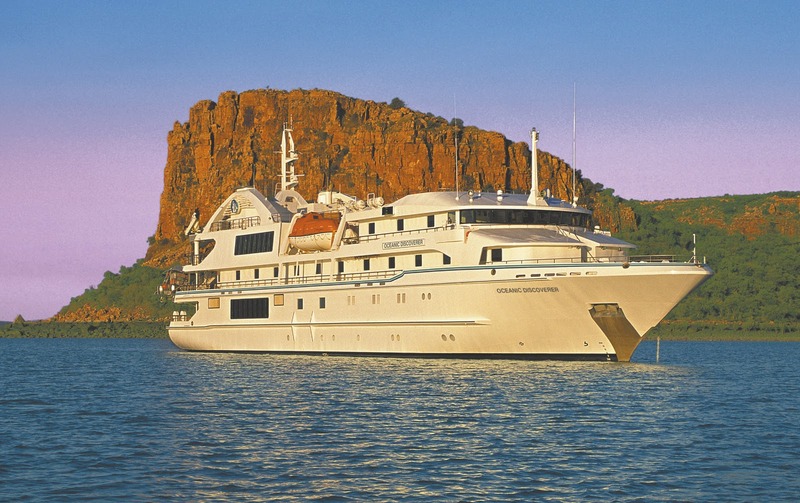 Coral Princess releases Spring Specials of up to 25% on selected Kimberley expeditions. Australia and the South Pacific's pioneer of small-ship expedition cruising Coral Princess Cruises is offering Spring Specials on August, September and October 2012 cruises. The 15 to 25% discounts are valid on their Kimberley Coast expeditions aboard the state-of-art, 72 passenger small-ship Oceanic Discoverer and the newly refurbished 48 passenger Coral Princess. The 15% discount, offering savings of up to $3,057 per couple, may also be combined with Coral Princess's past traveller discount, an additional 10% saving. The Kimberley wilderness of Western Australia is three times larger than England with a population of just 30,000. There is no better way to discover the remarkable Kimberley than aboard a purpose built small-ship, and Coral Princess's 10-night voyages between Darwin and Broome explores some of the planet's oldest and most awe-inspiring landscapes. The Kimberley's rivers carve their way through ancient, eroded mountains that were once the height of the Himalaya, dropping in champagne waterfalls such as the 80-metre King George Falls. Excursions ashore visit rock art galleries where Bradshaw (Gwion) paintings - the world's oldest known art - record a human history stretching back 50,000 years. Exploring the Kimberley Coast in August, September and October affords guests the unique opportunity to experience the region's annual whale migration. The cruise also explores the 800-odd islands of the Buccaneer Archipelago, including an exhilarating Zodiac ride through the Horizontal Waterfalls, where the largest tides in the southern hemisphere force their way between rocky cliffs in a formidable display of the forces of nature. 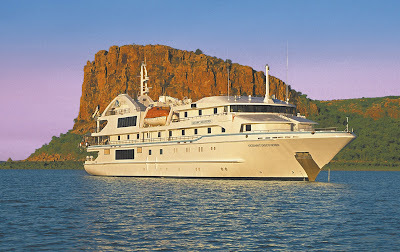 Spring Special prices for the 10-night Kimberley cruise start at $6,517.50 per person for past passengers ($7,386.50 for first time travellers) aboard Oceanic Discoverer for departures on 07 September and 17 September 2012 departures. The discounted prices aboard Coral Princess start at $5,242.50 per person for past passengers ($5,941.50 for first time travellers) on 31 August, 10 September, 21 September and 01 October 2012 departures. The reduced prices include all meals, lectures and services of expedition staff and excursions. As part of the Spring Special, single travellers will be able to avoid the dreaded "single supplement" when they travel on applicable dates, a saving of up to $5,095. The discounts apply to all new bookings on selected departures and are available until 31 July 2012 or until sold out. A team of biologists and enthusiastic volunteers from around the world has just completed a ground breaking survey of the Sea Otter population in the remote Kuril Islands. These volcanic islands to the north of Japan are home to a significant number of these endearing creatures that face an uncertain future in the face of challenges to their habitat. Led by otter biologist and specialist, Katya Ovsyanikova, the 18 day voyage successfully completed the first ever uniform survey throughout the entire Kuril chain, and covered a total of 228 nautical miles. In total, 1863 adult animals and 363 pups were counted. The data collected by ground and sea based teams using a new method of sampling will be analysed over the coming months. During the count divers also examined the seabed in well populated areas to determine the preferred diet of the otters. Ultimately this information will assist conservationists to come up with a strategy to protect the species. As with all scientific ventures, the data collected will no doubt raise many more questions about the Sea Otters and their habitat requirements. Heritage Expeditions hopes to be able to support the ongoing research in this field and thanks the volunteers for their magnificent efforts in the wild and unique Russian Far East.